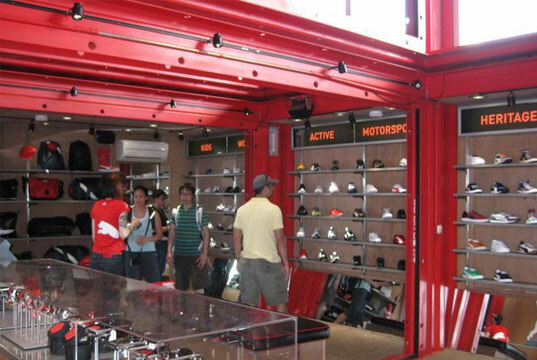 When we first heard about Puma City, the tri-level, 11,000-square-foot retail store and event space made of 24 refurbished shipping containers, we were intrigued by the popular sportswear brand’s pre-fab initiative. 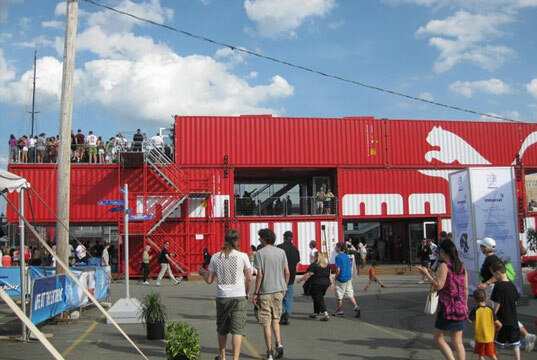 The portable Puma Store, which was designed by our favorite shipping container architects LOT-EK, makes clever re-use of discarded shipping containers and has been traveling around the world as a spokes-structure for both Puma and prefabricated buildings. So when we heard that the lego-esque stack, which was recently named best retail store by Travel + Leisure, would be making a stop in nearby Boston, we had to go see it in action! As amazing as Puma City looks in photos, seeing it in person on a warm sunny day when it’s filled with people is the only way to truly do it justice. 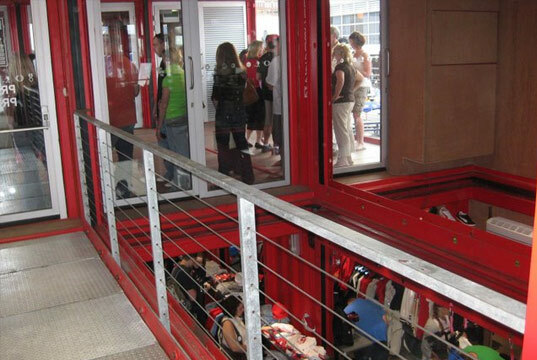 The store, which has a full bar equipped with a sunning deck and dance floor on the top level, seemed to be a magnet for young Bostonians eager to catch a few rays and look out over the harbor from a new elevated vantage point. The popularity of the venue was evidenced by a long line and the precariously packed look of the deck, which appeared to be so full of people that it might tip over at any second. “It was totally worth it!” said one man as he exited. Another aspect that might be missed in photographs is that, in addition to adding visual interest, the staggered stories create overhangs that protect the windows from the sun and keep the interior of the store cool. We visited on a particularly warm day last week and found that even the non-air conditioned areas of the store were shaded and breezy. LOT-EK did a great job of keeping the space from feeling stuffy and boxed in by cutting out the bottoms and sides of some of the containers; when you are on the second floor, for instance, you can look down onto the first. You know how much we love it when design elements look good AND add functionality or practical features. In this case, the cutouts serve double-duty by eliminating a good deal of weight, making transport of the containers more efficient and eco-friendly. 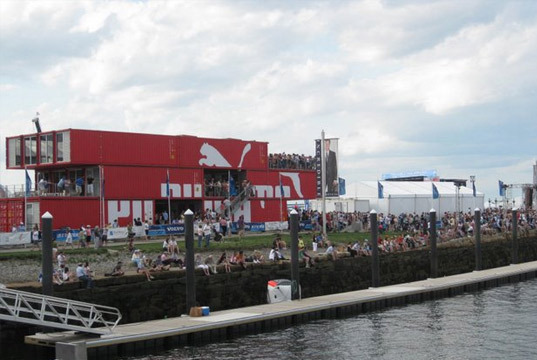 If you are in the Boston area and want to experience a top-notch pre-fab structure first-hand, we highly recommend checking out Puma City, which will be at Fan Pier until May 16th as part of a small village for the Volvo Ocean Race, a nine-month yacht race around the globe. 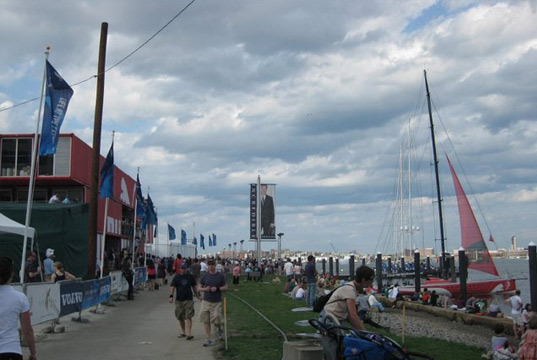 There are plenty of other cool things to check out in the area, like the Boston Institute of Contemporary Art (which is right next to Fan Pier), as well as other pre-fab structures like the Ericsson pavilion and an inflatable dome theatre showing a short film about the Volvo Ocean Race. Red definitely seems to be the color to go with if you decide to forego any sort of cladding; it adds a bit of sumptuousness to a volume that is decidedly hard-edged. 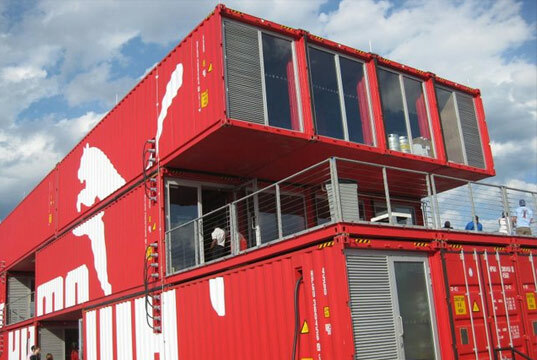 In either event, I am wondering when shipping container prefabs will graduate to less monolithic volumes and more complex interlocking layouts. 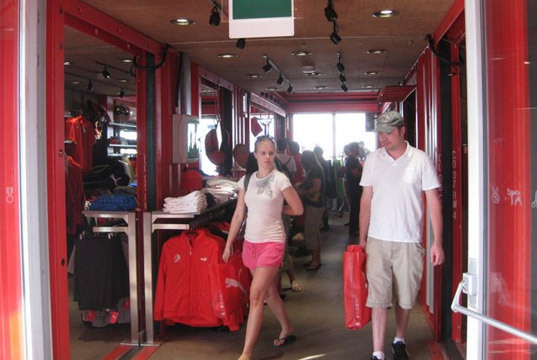 When we first heard about Puma City, the tri-level, 11,000-square-foot retail store and event space made of 24 refurbished shipping containers, we were intrigued by the popular sportswear brand's pre-fab initiative. 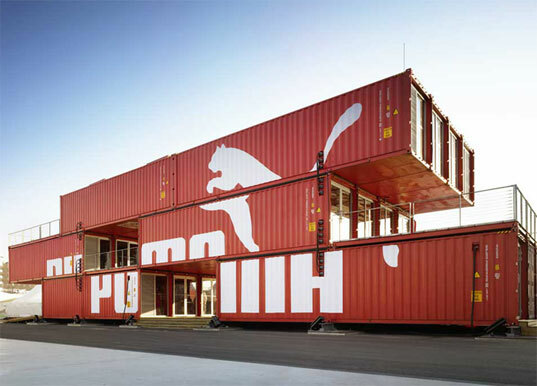 The portable Puma Store, which was designed by our favorite shipping container architects LOT-EK, makes clever re-use of discarded shipping containers and has been traveling around the world as a spokes-structure for both Puma and prefabricated buildings. So when we heard that the lego-esque stack, which was recently named best retail store by Travel + Leisure, would be making a stop in nearby Boston, we had to go see it in action!